Release Day for IN THE DARK!! It’s finally here–Release Day for my debut Romantic Suspense novel IN THE DARK!! Do you like dark, psychological Romantic Suspense? Have you ever fallen for the wrong guy and not been able to stop yourself? Are you looking for something new to read, just for fun? If the answers to any of those questions is “yes,” I hope you’ll check out IN THE DARK!! It’s available NOW in all eBook formats from Loveswept/Random House! Enter to Win Loveswept E-Galleys! Stop by Harlequin Junkie and enter to win one of 5 Loveswept e-galleys, including IN THE DARK! Sneak Preview of IN THE DARK at Romance with Flavor! Stop by Romance with Flavor to read another excerpt from my debut romantic suspense novel, IN THE DARK, before next week’s release! IN THE DARK is coming out Tuesday, January 28th in all eBook formats from Loveswept/Random House! Blog tour for IN THE DARK starts today! Visit Book Monster Reviews for a steamy sneak peek at my novel IN THE DARK and for a chance to WIN a fabulous PRIZE pack from Loveswept and Random House!!! The release is only 8 days away!! Winter Writing Festival Starts Today!! Need help getting going on your 2014 writing goals? Join the Ruby-Slippered Sisterhood for the fourth annual Winter Writing Festival! Set your own goals to maximize your writing productivity! The fun starts today, and the prizes are fabulous–enter to win a $250 gift card! 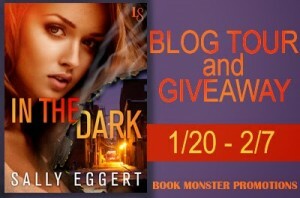 Win a Free Copy of In the Dark! Stop by the Romance at Random blog today, and enter to win one of 3 free copies of my book! I’m blogging this Thursday at Romance at Random, talking about my recent move and how it gave me a new understanding of one of my own characters, the heroine of my upcoming debut, In the Dark. Drop by and tell me if you’ve ever voluntarily turned your life upside down, and what it was that made you do it!